Learn simple techniques to release tension in the feet, hips, legs and low back. Learn about self massage techniques to release neck, shoulder and upper back tension. Wind down from the heat and activities of summer and settle into the season of self reflection and care. The Fall equinox lands on the Saturday September 22 and on top of the yoga practices daily I will be offering a special fall equinox ceremony. You will be staying riverside at The Columbia Wetlands Outpost Lodge for 2 nights and offers many opportunities to enjoy the great outdoors with activities such as canoeing, paddle boarding and kayaking, hiking or just enjoying the serenity of the forest. There is an 8 person hot tub on the grounds, and plenty of space to come together to unite as a group, or to enjoy some time alone. Your meals will be lovingly prepared by the most sought after caterer in town. This weekend is a wonderful opportunity to retreat into nature for wind down from Summer. Sunday - 7am gentle flow yoga, 1pm optional mini restore yoga before travel. Everyone is responsible for their own transportation, however, we will be creating a Facebook group in case anyone would like to share gas costs and carpool. The lodge is 576km from Edmonton, 289km from Calgary city centre, and 307km from Calgary airport for those flying in. The Columbia Wetlands is an area located in Golden, BC surrounded by serene forest, breathtaking mountains and water. You will feel comfortably tucked away in the beautiful accommodations at Columbia Wetlands Outpost Lodge. Rooms are double occupancy, but we will be sure to set you up with the most suitable roommate if you are traveling alone. There is an 8 person hot tub for connecting with others, or lots of room to explore and enjoy on your own. There is a very large, flat lawn with an incredible view where the yoga classes will take place each day. 3 delicious, healthy meals will be offered daily, prepared by our personal chef. Julie is one of the most sought after caterers in town, and you are sure to love her meals. She came highly recommended and we were lucky enough to secure her for this special, 3 day retreat. Please notify me of any dietary restrictions or allergies upon booking so that arrangements can be made. Join us in the quiet before the mall and RAAS opens for a beautiul meditation about Shadows and Silence. A meditation based upon sifting through our shadows (anger, frustration, resentment) and the silence and stillness after the storm of it. Offering some tools and discussion upon the shadows and how we can honor them. Afterwards enjoy some time in the RAAS Eats area as the stores open and chat and hang out. Mala and Me will be offering a free Black Onyx or Lapis Bracelet with a minimum $50 purchase in their store as well. Doors will open just before 9:30am, discussion and meditation will be 9:30-10am, hangout and shop will be 10:00 on. Stay as long as you would like! Pillow/folded mat/blanket to sit on. Journal if you would like. 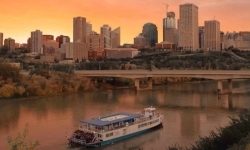 Yoga on the Edmonton Riverboat! Ever wanted to try yoga on a boat? Now is your chance! We will practice a one hour all levels flow class on the deck of the Riverboat (while it's docked) and then enjoy a buffet brunch afterwards! Optional sail at 12:15 for an additional $!0. Tickets: $45, for an additional $10 you can also add the sail down the river at 12:15. The Summer Solstice event was so much fun! Let's get together for a rooftop yoga and meditation session again!! Let the sun shine down and the breeze blow by. Set up will start 6 pm and the class will begin around 6:20. We will go through flow and end in a meditation. Cash. This is a pay what you can class where I will set up a bucket or something to put the cash into. You are welcome to bring your children if you think they will not be disruptive during class! Come join Sarah Doherty (Certified and Regitered Foot Reflexologist) and Jennifer Neilson (200 ERYT and 500 Registered Yoga Teacher) for an afternoon of taking care of your feet! Our feet are an important part of our lives. Not only do we walk on them all day, but how we treat them can make changes in other part of our bodies.Additionally there are many sensors in our feet for our whole body. So taking care of them if VERY important. In this event Sarah will go through some techniques and tips you can add to your daily life (or in between reflexology sessions) and Jennifer will guide a yoga and barefoot walking practice! It's almost officially summer! Let's get together for a rooftop yoga and meditation session to celebrate! It is also International Yoga day! Let the sun shine down and the breeze blow by. Wanted to try kickboxing, but a little intimated by trying out a new gym? Come check out this fun night of 45 minutes of kickboxing and 45 minutes of yin yoga to relax afterwards. We will do some warm ups, drills and some shadow boxing, with some fun hard work at the end. 45 minutes of hard work and trying something new. After the hard work we will stretch it out with some low impact, stretching yin yoga. Finishing off with a relaxing guided savasana. Grab a friend and come! Gloves not required, but can be brought if you have some. Friday Flow Yoga classes are starting up at the new Empowered Yoga Collective Space. The second week I am hosting a "Good Time Charlie" Yoga class. 90 minutes of flow yoga, savasana and a meditation all about having a good time. Find variations of postures that FEEL GOOD to you today. Permission to find your own yoga while being in the room of other yogis doing the same thing. We will do vinyasa flow yoga and I will offer MANY variations (harder or easier) and you just find YOU. Afterwards enjoying a Bring your own bevie and chat. Cost: Pay what you can suggested donation of $5, $10 or $20.